Map Marketing applies its GIS-based IT to help all kinds of local businesses (e.g. Stores, small schools) to grow in the regions where they are located. Map Marketing provides a mechanism that “conveys the information the customer wishes to disseminate to the optimum area through the optimum media” (Area Communication Design). Map Marketing endeavors to achieve local vitalization, vitalization of small to medium-sized retails businesses, vitalization of shopping districts and commercial facilities, vitalization of all types of local industries and, finally, vitalization of Japan (vitalization of society and “the world”) through the dissemination of “Area Communication Design” throughout society. 14th Floor,BB Building 54 Sukhumvit 21 Road, Kwaeng Klong Toey Nua, Khet Wattana, Bangkok 10110. What is Area Marketing and Commercial Regional Analysis? By identifying regional characteristics, Area Marketing and Commercial Regional analysis makes it possible to make geographical judgments that will prove useful when opening a new store or distributing advertisements. If, for example, a person wished to open a family-oriented store, the best choice of location would probably be a region where there are a lot of families. Again, if, for example, a business wanted to distribute advertisements for luxury cars, the logical choice would be a region characterized by a large number of high annual-income households. GIS is the acronym for Geographic (Map) Information System. There are many types of GIS and any digital system that shows information of one kind or another on a map falls into the category of GIS. A typical example familiar to everyone is the car navigation system. Map Marketing’s TerraMap Series is an area marketing GIS or, in other words, a GIS used exclusively for area marketing and commercial regional analysis. By collecting statistical data for each area (administrative divisions of Japan, municipalities, larger sections of villages, town and street names and grids) from sources such as the national census, for example, this software facilitates identification of regional characteristics. A package comprising a nationwide town and street name polygon and national census data The TerraMap Series features an abundance of functions and data needed for marketing and commercial regional analysis. Already in use in 2,000 companies! 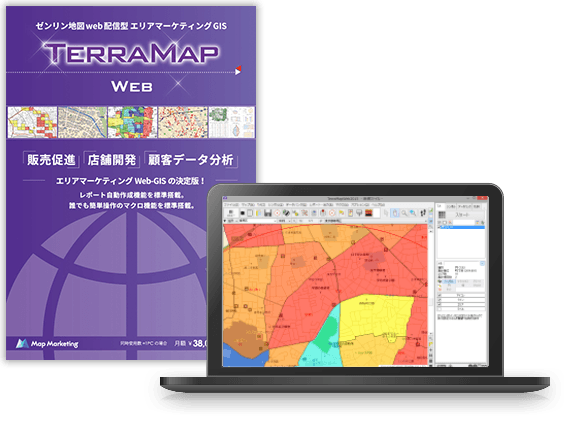 The TerraMap Series has the highest record of introduction as a marketing GIS. Use for Establishment of New Stores, Sales Volume Forecasts and Strategic Dominance. 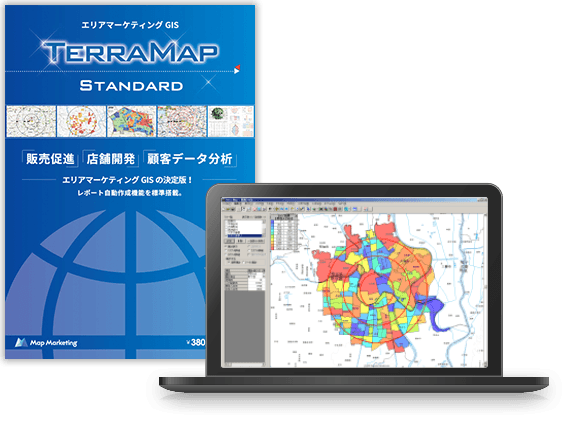 The TerraMap Series enables the user to carry out tasks such as making sales volume forecasts needed for store development and FC expansion, verification of strategic dominance and analysis of competitor stores. Collection of data on candidate properties and commercial regional data on existing stores enables the user to implement effective store-establishment planning. Use for Advertising Inserts, Postings and DM The TerraMap Series enables the user to boost and optimize sales promotion by selecting sales promotion-target areas where a large target segment exists and also provides the capability to analyze (measurement of effects) responses after implementation of sales promotion. Effective Use of Member’s Data and POS Data The TerraMap Series enables the user to acquire data from sources such as point cards, POS systems and member lists for use in analysis of area shares and customer distribution, for example. This gives the user a picture of actual commercial areas that will make it possible to form sales strategies and realize strategic dominance. Use for One-to-One Marketing The TerraMap Series allows the user to acquire data on an address-precision level of house number/lot number and building number for pinpoint control on maps, making it possible to optimize practical aspects such as house visits and route sales to support each client household. Attention: Due to the regulation of GDPR, we are suspending our response from EAA region entities. Please submit enquiries by e-mail. Please note that responses to enquiries submitted in languages other than Japanese may take time. English versions of products are not available at the present time. Use of Japanese versions in countries outside Japan will be subject to prior investigation. Copyright©Map Marketing Co., Ltd. All Right Reserved.